Five remarkable projects have been selected as finalists in the competition for ASCE’s prestigious 2015 Outstanding Civil Engineering Achievement Award (OCEA): the Colton Crossing Flyover in Colton, California; the Echo Park Lake Rehabilitation Project in Los Angeles, California; the Halley VI Antarctic Research Station in Brunt Ice Shelf, Antarctica; the San Francisco–Oakland Bay Bridge New East Span in San Francisco and Oakland, California; and the Ward County Water Supply Project, running through Monahans and Odessa, Texas. ASCE also announced the Thermal Integrity Profiler, a collaboration between Pile Dynamics Inc., the University of South Florida, Foundation & Geotechnical Engineering LLC, Florida Department of Transportation, and the Washington State Department of Transportation is the 2015 winner of the Charles Pankow Award for Innovation. The OCEA award honors the project that best illustrates superior civil engineering skills and represents a significant contribution to civil engineering progress and society. Nominations are judged by a volunteer jury appointed by the ASCE Board of Direction based on four criteria: originality and innovation; resourcefulness in planning and solving design challenges; sustainability considerations; and project planning and delivery. The winning project will be announced and presented at ASCE’s 2015 Outstanding Project and Leaders (OPAL) gala, which will be held March 26 at the Renaissance Arlington Capital View Hotel, in Arlington, Virginia. Each of the 5 OCEA finalists will also receive merit award trophies at the gala. 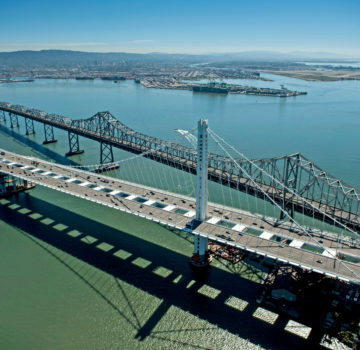 At 2,047 feet long and 258.33 feet wide, the new East Span of San Francisco–Oakland Bay Bridge is considered the longest single-tower, self-anchored suspension span (SAS) bridge in the world – and the world’s widest bridge. Designed to support 10 lanes of traffic and more than 300,000 vehicles per day, the $6.4 billion project has become the State of California’s largest public works project to date. The Colton Crossing Flyover is an “at grade” rail-to-rail intersection situated about 50 miles east of Los Angeles. With an average of 125 crossings daily, it is one of the busiest and most congested railroad crossings in the U.S. Engineering firm HDR designed an innovative approach to eliminating the chokepoint by constructing an 8,150-foot flyover structure to take the Union Pacific Railroad’s east-west tracks 35 feet above the north-south tracks of the BNSF Railway. The Echo Park Lake Rehabilitation Project by the Black & Veatch Corporation is designed to improve the water quality in the 13-acre lake to meet the objectives established by the California Regional Water Quality Board. The bond-funded $45 million project redefined the lake as a stormwater treatment facility. The sustainable, rehabilitated lake and improved watershed returned the sparkle to a Los Angeles icon. Located on the 500-foot-thick Brunt Ice Shelf floating in the Weddell Sea in Antarctica, the Halley VI Research Station is run by the British Antarctic Survey to study Earth’s atmosphere. Designed by AECOM and Hugh Broughton Architects, the futuristic, $43 million state-of-the-art research facility is segmented into 8 modules, each sitting atop ski-fitted, hydraulic legs designed to cope with rising snow. Launched in February 2013, it is the first fully relocatable Antarctic research station in the world. Ward County Water Supply Project. Photo Credit: Freese and Nichols, Inc. The Ward County Water Supply Project involved the design and construction of 21 groundwater wells, 65 miles of pipeline, and 4 booster pump stations. Designed and constructed in less than 18 months – two weeks ahead of schedule – the $100 million project, which was delivered $25 million under budget, encountered and overcame many engineering challenges. Among them were producing water from an aquifer with highly variable water quality, installing pipelines through several miles of shifting sand dunes, dealing with labor and housing shortages related to the oil and gas boom in West Texas, obtaining environmental permitting, and acquiring easements. The Thermal Integrity Profiler. Photo Credit: Pile Dynamics, Inc. The Thermal Integrity Profiler (TIP) is a system consisting of instrumentation that measures the temperature generated by concrete cast-in-place foundations during the cement curing process and software that allows engineers to evaluate the quality of the foundation based on the measured temperature profile. Since 2011 when TIP came to market, it has been successfully used in more than 40 projects in the U.S. and abroad. At first employed in conjunction with other integrity testing methods in a demonstration setting, TIP is now starting to be specified on its own, as the industry recognizes its technical and time savings potential. Watch ASCE News later this year for individual articles about the 5 OCEA finalists and the Pankow award winner. Roumen V. Mladjov, S.E., C.E. While the new East Span of San Francisco-Oakland Bay Bridge is the most distinguished project between the 5 finalists and I do not like making negative comments, this project cannot qualify for an Outstanding achievement. The only remarkable qualities of this project are: the size, the extraordinary cost (total and per m2), the very high quantities of steel and concrete per m2 and the 12 years long construction period. Unfortunately this project is one missed great opportunity for American Bridge Engineering to demonstrate that we are still capable of designing and building remarkable bridges. Please recommend to the members of the jury to review the technical and economical data for this project compared with other recent bridge projects before they make a decision. Awarding this project will be a bad example for engineers and transportation authorities; the only lesson learned from this project is that such constructions (for both the SAS and the Skyway) shall not be repeated again!